Aquaculture has become of the fastest growing segments of agriculture around the world, but until recently many people have been unaware of its existence. The practice of raising fish is centuries old with a rich history of techniques and scientific advances. The History of Aquaculture traces the development of fish farming from its ancient roots to the technologically advanced methods of today. 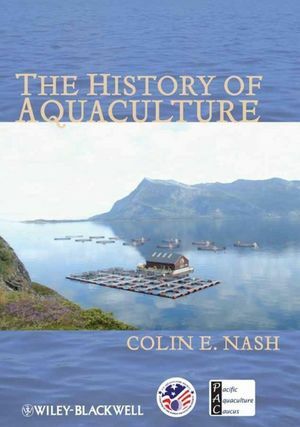 The History of Aquaculture is a comprehensive history of captive fish production from its small scale prehistoric roots through to the large-scale industrialized practices of today. Thirteen chapters take readers chronologically through the evolution of this important discipline. Chapters cover key periods of advancement and trace changes in the field from subsistence fish farming in the Middle Ages through the efforts to build global capacity for fish production to meet the needs of the world's ever growing population. Informative and engaging, The History of Aquaculture will broadly appeal to aquaculture scientists, researchers, professionals, and students. Colin E. Nash has worked in aquaculture research for more than four decades, In addition, he was the chief editor for Aquaculture for ten years; the director of the program for FAO Aquaculture Development, the technical director of France's Cofrepêche, and finally most recently NOAA. 1 Fish and Shellfish as Food. 2 Seeds in Antiquity (2000 bc to ad 500). 3 Subsistence Farming through the Middle Ages (500–1450). 4 The Slow Dawn of Science (1450–1900). 5 The Roots of Modern Aquaculture (1750–1880). 6 Farming the Sea (1880–1920). 7 Fifty Lost Years (1900–1950). 8 Aquaculture in a World at War (1935–1945). 11 The Rise of the Institutions (1970–1980). 12 Building Global Capacity (1980–2000). 13 Modern Times (twenty-first century).